So if your kiddos are anything like mine, they have a few unspoken "rules" they follow that I've had to try and correct. One of those is: "I wore this for five minutes so it needs to go into the hamper to be washed." Another is: "I'm going to play with that toy later so I'm leaving it in the middle of the room." The one that I hear and see most often is: "I had a cup but I don't know where it is/left it somewhere/used it already so I need a new one." However, I've found a nifty solution to help combat that! 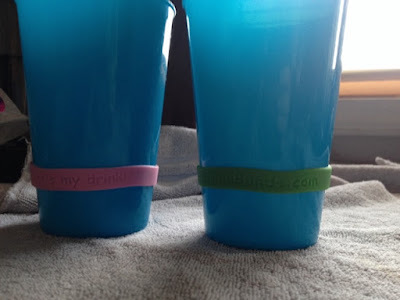 DrinkBands are just what they sound like - a unique band that fits around most any size cup to help identify whose drink is whose. They help to cut down on counter clutter and multiple glass uses that my kiddos have been fond of! They are especially useful for those with large families, more than one family living in the same residence, parties, holiday meals, and other types of gatherings. I recently got to review the 9 pack of DrinkBands and found them to be extremely durable. They fit many different kinds of our glasses (plastic or glass) and the kids enjoyed picking out their color for the day & sticking to it. They needed occasional reminders at first but soon got the hang of it! They came in a cute tin (pictured above) that kept them contained when not in use. The bands are offered in many different quantities or packages with varying colors or themes, like camo or Christmas, and you can even get them personalized with names. The regular size bands fit most regular to large-sized glasses, cups, mugs, mason jars, and sports bottles. Small size bands fit most small glasses, small sippy cups, baby bottles, and stretch to fit regular glasses. The 9 pack costs $15.95. Other packs/bundles range from $9 - $30, depending on the amount of bands and the different colors/themes. 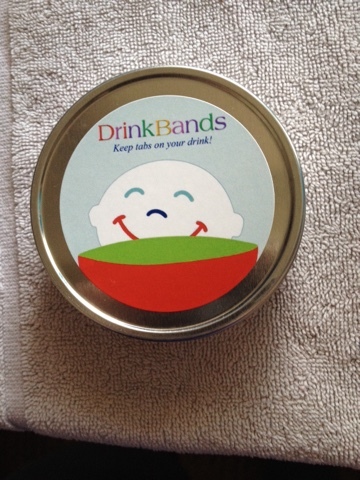 You can buy individual bands for $2 - $2.50 and they also offer gift certificates! Disclosure: I was given a 9 pack of DrinkBands in order to facilitate this review after expressing my interest in them. All opinions expressed are my own.